See Legend for a description of the fields. Set GS = 0 if you want to compute the weight of the test mass for some not moving location. If you set GS = 0, the centrifugal acceleration is calculated with the formulas for a stationary object rotating with the earth! Use the Lat and Alt to specify this fixed location then. The results of this calculation are shown in the right column. The following table compares the magnitudes of the most varied influences on the gravitational acceleration. The first 5 influences are taken into account in the calculations obove. +30 mGal correspond to −100 m = −330 ft altitude. 100 mGal = 0.001 m/s2. 0.000062 0.00063 % Coriolis: Maximum influence of the Corriolis-Effect at the poles on an airspeed of 480 kt, if the airplane follows a great circle on the surface of the earth. On the equator the influence is 0 . The calculations are based on an ellipsoid. The real shape of the earth varies from place to place. Therefore, gravitation also varies accordingly. The variation, however, is less than ±0.01% of gravitation at most of the places on earth. Note: the Coriolis effect increases the effective gravitationals acceleration slightly. It actually works horizontally (cH) but, together with the gravitational acceleration, causes a slight deviation of the same and a minimal increase by c.
The influence of the tides is negligible in the calculations. The influence of the buoyancy of the atmosphere and the coriolis effect are very tiny and can be neglected too. Reset resets all fields ​to their initial values. To reset only a specific field to its initial value, place the cursor in the field and press the ESC key. Clear sets all fields to 0. GS: Speed of the aircraft with respect to the ground surface (ground speed). 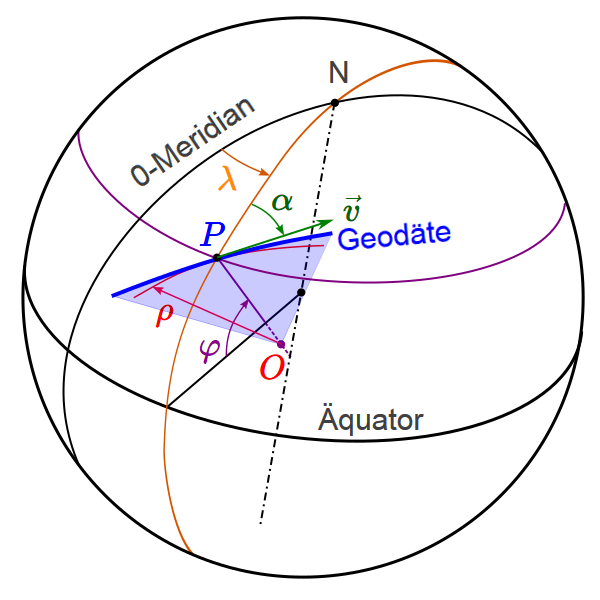 Lat: Degree of Latitude of the aircraft position. The equator is 0, the North Pole 90 and the South Pole -90 degrees. Latcal: Latitude at which the scale has been calibrated with the test mass Wcal. Wcal: Weight of the test mass. Course: heading in degrees North. North is 0, east is 90, south 180 and west is 270 degrees. Alt: Altitude of the airplane above sea level. Altcal: Altitude above sea level, on which the scale has been calibrated with the test mass Wcal. Model: The earth is not a perfect sphere and can be approximated by an Ellipsoid . Model determines with which model the calculations are performed. For Sphere, the average radius R of the earth is used, see (2). grel: Relative effective acceleration. This is the effective acceleration gh in the aircraft relative to the effective acceleration go on the earth, see (23). If the aircraft is on the ground, grel = 1. Values less than 1 mean that due to the centrifugal acceleration, one is correspondingly lighter in the aircraft than on the ground. Wo: Weight of the test mass displayed on the scale at the position of the aircraft at sea level. go: Effective acceleration on the earth's surface, see (5). This corresponds to the vectorial sum of gravitational acceleration goG and centrifugal acceleration aoZ. goG: Gravitational acceleration on the earth's surface, see (9). Depending on the mass M of the earth and the distance R from the center of mass. aoZ: Centrifugal acceleration on the earth's surface, see (7). This is dependent on the rotational speed or rotation period T and the effective radius for the latitude Lat. The effective radius is the perpendicular distance of the point P from the earth axis. On the poles this radius is 0, on the equator it is equal to the radius of the earth at that location. R: Radius of the earth at latitude Lat. This is the distance of the point P from the center of the earth, see (3). In the sphere model, this radius is the same size everywhere. ρ1: Radius of the red cutting ellipse at point P, i.e. the geodesic in east/west direction, see (41). veq: Tangential velocity at the equator, veq = ω · R. Depends on the rotational speed ω or the rotational period T and the radius R on the equator, see (2). go,cal: Effective gravitational acceleration at the point where the scale has been calibrated, ie at the latitude Latcal at altitude Altcal. Wh: The weight of the test mass as displayed on the scale in the aircraft at the cruise altitude Alt. gh: Effective acceleration in the aircraft, see (11). This is the vectorial sum of gravitational acceleration ghG and centrifugal acceleration ahZ in the aircraft. ghG: Gravitational acceleration in the aircraft, see (17). Depending on the mass M of the earth and the distance from the mass center, i.e. the earth radius at latitude Lat and the altitude Alt. ahZ: Centrifugal acceleration in the aircraft, see (21). This is dependent on the tangential velocity v of the aircraft on the geodesic with respect to space in altitude Alt and the radius ρh of the geosdesic at the position of the aircraft. ρh: Radius of the geodesic, see (25). In the sphere model, this is the radius R of the earth plus the altitude Alt of the aircraft. In the ellipsoid model, ρh is also dependent on the direction of flight Course and is a value between ρ1 and ρ2 plus the altitude Alt of the aircraft, see (24). 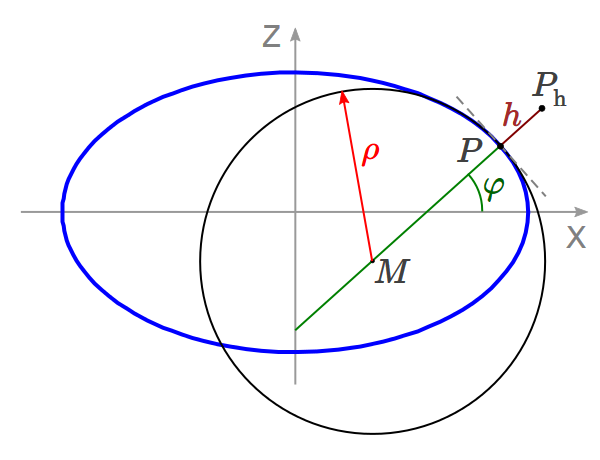 ρ2: Radius of the blue cutting ellipse at point P, i.e. the geodesic in north/south direction, see (27). vrot: Tangential speed of the point Ph due to the earth's rotation, see (16). Is dependent on latitude Lat and the altitude Alt. v: Combined speed of the aircraft and the rotation of the earth at latitude Lat, see (13). This is the tangential velocity of the aircraft on the geodesic with respect to a non-rotating earth. Together with the radius ρh of the geosdesic, this rate determines the centrifugal acceleration ahZ acting in the aircraft. The default values in the Calculation Form are from a real flight with a Bombardier Global Express . The aircraft had about 100 kt tailwind and flew at a speed of about 500 kt True Airspeed (TAS) east (kt or kn = knot = Nautical miles per hour). The velocity causing the centrifugal acceleration is composed of the tangential velocity due to the rotation of the earth vrot at a latitude of −35° and the airspeed with respect to the earth surface of 600 kt (true airspeed TAS + tailwind), see (13). Even under these extreme conditions, the centrifugal acceleration ahZ is so small that the relative effective acceleration barely shows a value below 1 on the G-display: in particular 0.9907796, which is rounded to 0.99. This means that a man who has a weight of 100 kg on the ground at position P weighs only 99 kg in the aircraft. Because the aircraft flies towards the east, that is, with the earth's rotation, the rotation and flight speed add up, resulting in a maximum centrifugal acceleration which makes the man lighter. When the aircraft flies towards the west, i.e. contrary to the earth's rotation, the two speeds partly cancel out, and the man then weighs in the airplane roughly the same as on the ground. Check this by entering 270 at Course. This effect is actually measurable: see Experiments with a Test Mass. The earth is not a perfect sphere. It is slightly flattened at the poles and the diameter at the equator is 42.8 km greater than at the poles. Gravitation on the surface is also not uniform, but varies by mass distribution on the surface and inside the earth. The product G·M can be determined more precisely than the individual factors . In order to calculate the accelerations at a specific point P on the reference ellipsoid, we must calculate the position of the latitude of degree φ . Along the latitude through this position the accelerations are constant in magnitude. The following formula can be used to calculate a point P on the surface of the earth with h = 0 or to compute a point Ph that is at a distance h from this point above the surface . The connecting line of these two points is perpendicular to the ellipsoid. The origin of the coordinate system is at the center of the ellipsoid. In geosciences, the effective (gravitational) acceleration of a celestial body is composed of its gravitational acceleration (gravitation) due to the mass of the body and the centrifugal acceleration in the reference system, which rotates with the body  . The effective acceleration on the earth's surface is needed as a reference for the calculation of the relative effective acceleration in the aircraft. The index o stands for the altitude 0, that is, the sea level. 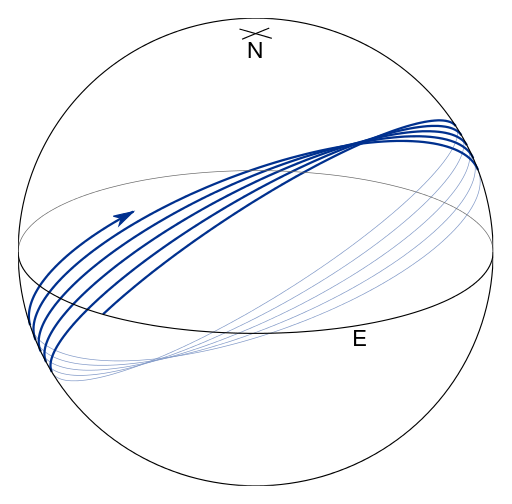 The centrifugal acceleration on the earth's surface aoZ acts perpendicular to the rotation axis, depends on the degree of latitude φ and always acts outwards, i.e. its Z component is 0. The magnitude of the centrifugal acceleration is therefore equal to its X component. The Sidereal day is the duration of a full revolution of the earth around itself against the fixed starry sky. The mean sidereal day on the earth is almost 4 minutes shorter than the sloar day of 24 hours, see T in (2). Airplanes fly the shortest possible connection between two points on the earth's surface. Such a connection line is the Geodesic . On a sphere, each geodesic is located on a Great circle . If the earth is approximated by an Ellipsoid , geodesics generally do not form closed curves, see picture. To simplify the calculations on this page, I approximate the geodesics by a cutting ellipse optained by an intersection plane through the ellipsoid. These ellipses pass through the point P and contain the perpendicular through the point P. These ellipses are rotated by a certain angle α from the longitude through P. For these ellipses the radius of curvature ρ� relevant to the centrifugal acceleration can then be calculated at point P.
The centrifugal acceleration in the aircraft does not act perpendicular to the axis of rotation of the earth but upwards perpendicular from the surface of the ellipsoid because the aircraft moves on a geodesic (blue) with respect to a non-rotating ellipsoid. This has a different curvature ρ� than the longitude or latitude of the ellipsoid at the point P and the center of the osculating circle of the geodesic lies not on the axis of rotation of the earth but on the violet axis with angle φ in the image. The Inertial Reference System measures the accelerations in 3 mutually independent orthogonal axes. The Z direction points upwards in respect to the aircraft. In cruise, all forces on the aircraft are balanced so that the effective acceleration acts along the negative direction of the Z axis. In order to calculate the accelerations in the aircraft, we must calculate its position Ph from the latitude φ and the altitude h over sea level. The position Ph of the aircraft can be calculated by the formula (3). To calculate the centrifugal acceleration ahZ in the aircraft, we need its absolute velocity (speed) v on the geodesic. This is the speed with respect to a non-rotating ellipsoid. It is vectorially composed of the tangential velocity vrot of the point Ph due to the earth's rotation and the velocity vgs and the course α of the aircraft with respect to the surface (ground speed GS). For the calculations, a flat 2-dimensional coordinate system is used at the points P and Ph, respectively, with the Y coordinate facing north and the X coordinate facing east. The speed vrel at altitude is somewhat higher than the ground speed vgs because of the earth curvature. The trajectory of the aircraft is a geodesic which is located on an extended ellipsoid which has the local perpendicular distance h to the ellipsoid of the earth's surface. The position Ph is calculated using formula (3), by using Alt for the altitude h.
To calculate the effective acceleration at the point Ph at a distance h from the reference ellipsoid, there is a formula according to WGS84 . The corresponding acceleration acts perpendicular to the surface of the ellipsoid and is composed of gravitational acceleration and centrifugal acceleration due to earths rotation. However, the aircraft is not connected to the surface and is therefore not exposed to the centrifugal acceleration of the surface. The Centrifugal acceleration in the aircraft must be determined in a different way. The gravitational acceleration in the aircraft is obtained by subtracting the centrifugal acceleration due to earths rotation from the effective acceleration at altitude h calculated according to WGS84. In contrast to the centrifugal acceleration of the earth's surface, the centrifugal acceleration in the aircraft acts away from the geodesic curvature, i.e. perpendicular to the surface of the ellipsoid at the point Ph. Its magnitude can be calculated from the absolute velocity of the aircraft v on its non-rotating trajectory (geodesic) and the radius of curvature ρh of the geodesic at altitude h.
The angle of the geodesic with respect to the non-rotating ellipsoid can be calculated from the total velocity , see (13). This velocity takes the direction of flight α and the rotation of the earth into account. Note that does not have the same heading as the Ground Speed because of the rotation of the Earth. If then can be set because the centrifugal acceleration in the aircraft is in this case 0 anyway. If the aircraft is on the ground, and are equal, so is displayed. Notice: May be the aircraft uses a mean effective acceleration of go = 9.80665 m/s2 instead of the above computed real effective acceleration at the point P.
In order to be able to calculate the centrifugal acceleration ahZ (21) in the aircraft on its trajectory around the earth, we need the radius of curvature ρh of the trajectory at point Ph. We obtain the radius of curvature by calculating the radius of curvature ρ of the geodesic on the earth ellipsoid and adding h.
The calculation of ρ takes place via the green hatched cutting ellipse. The rotation axis of the green cutting ellipse is the connecting line PQ and is rotated by the angle γ with respect to north direction. This rotation axis is in general not identical with the major axis of the ellipse! An equation for the Directional Ellipsoid Radius can be found in the Wikipedia. Although the presented equation below is not correct, it is a good approximation. If I find time, I will incoorporate the equation from Wikipedia. Note that in the conversion of the ground speed to the speed at altitude (15) the geodesic in the coordinate system rotating with the earth must be used. These geodesic correspond to the cutting ellipse rotated by the angle γ = α, where α is the heading (azimuth) with respect to the rotating earth. For the centrifugal acceleration ahZ, the geodesic must be described in the non-rotating coordinate system since the aircraft is detached from the earth. The rotation angle γ for the corresponding cutting ellipse can be calculated using the absolute velocity , see (22). For the calculation of the radii of curvature ρ1 and ρ2, I need the lengths of the semi major axes of the red and blue ellipse. The intersections of the ellipse with the straight line are obtained by inserting the straight line equation in the ellipse equation. For the calculation of the semi major axis aS of the red ellipse, I use the following trick: If the ellipsoid together with the red ellipse is stretched in the Z direction so that the ellipsoid becomes a sphere with radius a and the red ellipse becomes the red dotted circle, the geometry in width does not change. The semi major axis aS of the red ellipse is therefore equal on the ellipsoid as on the sphere. The semi major axis on the sphere can easily be calculated. Stretching the ellipsoid to the sphere for the calculation of aS. Front and side view. First, I must congratulate you on producing such an excellent calculator. It’s thoroughly designed and presented. I especially approve of the inclusion of the mathematical basis for the calculations although some of it is beyond my mathematical ability. My first instinct when seeing a calculator like this is to apply a sanity test, ie put in some simple numbers and see if they produce a sensible result. So I set the reference to ground level at the pole and set the plane to be stationary on the ground at the equator and Wcal=100. With a spherical model this produces a weight difference of -0.344% which is exactly what I calculated using the simple formula of w^2 x R/ g. Where w is the earth’s angular velocity, R is its radius and g = 9.81 m/s^2. So far so good. I then changed the model to ‘ellipsoid’. Since I know that the eccentricity is about 0.34% and the gravitational force is inversely proportional to the square of the distance, I expect this to add approximately another -0.68% giving a total weight difference of about -1%. But your calculator only shows -0.53%. It has only added -0.18%. There’s a large error somewhere. So am I doing something stupid or is there problem with your ellipsoidal model? I notice that when I switch between Spherical and Ellipsoidal models the value of R, which you say is the distance of the point P from the centre of the earth, only changes from 6371 to 6378 which is only 0.1%. I also notice that if I change the position of the aircraft to the pole, then R still increases to 6378 for ellipsoidal, surely it should decrease. Here is the problem: Newton's formula g = GM / R2 is only valid for an exactly spherical object of mass M, or if the distance from the object is much greater than the size of the object. Newton's formula is not valid near any other shape! This is obviously not the same result. But if in (42) d >> r (d is much grater than r) we can ignore r and get Newtons formula (43) again. Note that the effective acceleration (vectorial sum of gravitational and centrifugal acceleration) acts always exactly perpendicular to the surface of the ellipsoid. If that would not be the case, there would be acceleration components acting parallel to the surface. On a mostly liquid body that would produce surface streams or tectonic activities until the resulting shape is such that this components vanish. The resulting shape finally is the ellipsoidal shape we observe for each planet above a certain size. Note that the gravitational acceleration vector (not to confuse with the effective gravitational acceleration vector) on the surface of an ellispoid generally does not point to the geometric center. So to compute the gravitational acceleration near the surface of an ellipsoid we must not use Newtons formula. To get the formula for any shape, we have to divide the shape into infinitesimal tiny volume elements and compute the acceleration vectors for each element and integrate (sum) them. For an ellipsoid the resulting formula for the effective acceleration is shown at Effective acceleration. To get the gravitational acceleration you have to vectorial subtract the centrifugal acceleration from that. number33: I notice that when I switch between Spherical and Ellipsoidal models the value of R, which you say is the distance of the point P from the centre of the earth, only changes from 6371 to 6378 which is only 0.1%. On the ellipsoidal earth the equator radius is a = 6378.137 km and the pole radius is b = 6356.7523142 km. The difference is 21.3846858 km or about 0.34%. number33: I also notice that if I change the position of the aircraft to the pole, then R still increases to 6378 for ellipsoidal, surely it should decrease. Please check that again. When I set the position to the pole (latitude = 90°) I get R = 6356.752 km which is less than 6371 km. When I set the position to the equator (latitude = 0°) I get R = 6378.137 km which is more than 6371 km. The ellipsoidal shape of the earth means not only a bulge at the equator but also a flattening at the poles compared to a corresponding sphere with a mean radius of R = 6371 km and the same volume and mass as the ellipsoid. Thank you for your explanation Walter, I see my error now in assuming that the gravitational attraction behaved as if it was concentrated at the centre of gravity. With hindsight this is obviously not true although I'm surprised that such a tiny eccentricity makes such a large difference in the weight calculation. Now I see why you have that complex formula (5) for gravitational acceleration. Now I just need to understand why the simple formula works ok for a perfect sphere. I'm retired now and my days of using integral calculus are long gone. As for the value of R, I get the same value as you now. I must have set the reference latitude to 90 instead of the plane's latitude.